Today we released a new report on local sales taxes, which updates a study we published in February. The new report updates the state and local sales tax rates across the country and ranks each state on its combined state rate and average local rate. Click here to read the report. Most shoppers have some idea of the sales tax rate imposed by their state, or they can at least find the rate by looking at the receipts they receive with every taxed purchase. However, it’s easy to forget about the local rates imposed by many jurisdictions on top of the statewide rate. Local option sales taxes can add significantly to the amount consumers pay for everyday goods; in some states, they can more than double the average sales tax paid by consumers. The map below (click here to download it on our website) illustrates the combined rate and rank for each state, and a table in the new report displays the state rate, average local rate, combined rate, and rank of the combined rate for each state and the District of Columbia. Our report finds that although 14 states have no general local option sales tax, these states do not necessarily rank favorably. 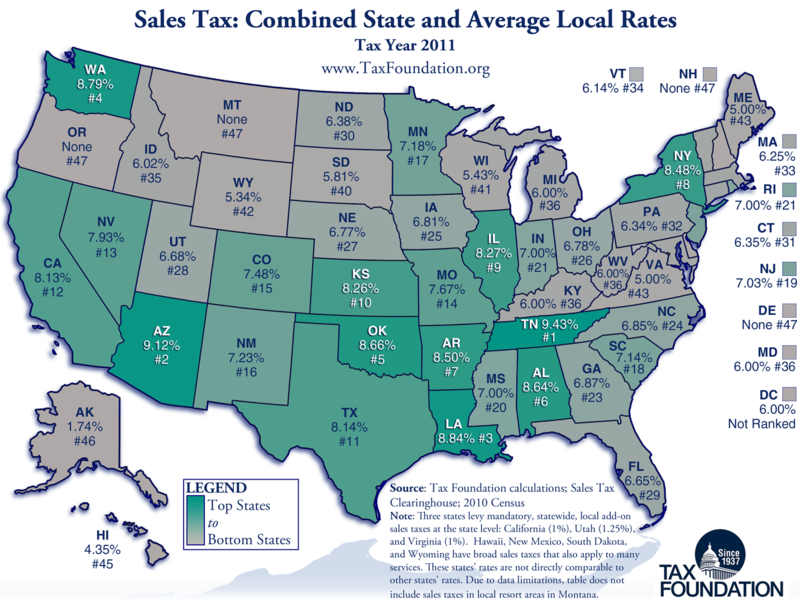 Indiana, for example, has no local general sales tax yet still ranks 21st because of a 7% statewide rate. The highest sales taxes jurisdiction in the U.S. is Tuba City, Arizona, which has a combined rate of 13.725%. This is composed of a 6.6% state tax, a 1.125% Coconino county tax, and an additional 6% tax levied by the local Navajo tribal government. Click here for the full study, the data by itself, or the map by itself.